There have been many talks about ‘getting the ball rolling’ to resolve the issue of jailed fishermen between India and Pakistan. But nothing conclusive has happened. Year after year, innocent fishermen from both sides are victimised, simply because there is no demarcation of water boundaries. 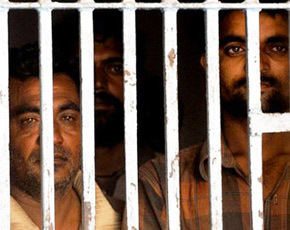 According to Dawn, at least 400 fishermen have been languishing in jails in both countries for no intentional crimes. Despite no border markers, fishermen are meted out a sentence of six months in prison under the Foreigners Act of 1947. According to officials, by the time the verdicts are usually announced the fishermen have already served out the term but continue to languish in jails for years waiting for procedural formalities by the authorities for their release. What happens to the families of these incarcerated sole bread winners is devastating. As if bearing the thought of your loved one rotting in captivity isn’t enough, the families suffer the blow of huge losses of seized boats and trawlers which are bought on borrowed money. Reports state that over 500 Indian fishing boats and trawlers had been impounded by Pakistan, while more than 200 boats and trawlers are in the custody of India. Why has there not been any prompt action from ether of the governments? In terms of diplomacy, who even stands to gain from these blatant abuses of human rights? Are these fishermen looked upon as collateral damage in the bigger scheme of things? More importantly, why must we always be expected to accept collateral damage? What cost do these invisible boundaries really come at? These are poor scarcely-literate folks who suffer for no fault of theirs. No God will forgive us for causing such people and their families misery. May we quickly have an enlightened system in place and seek to to ensure that now and in future these people who live a hand-to-mouth existence, can have a life without a Sword of Damocles hanging over their heads. This is in fact the tragedy of Partition. Despite having common culture, common history, common people the masses are cursed to suffer. India and Pakistan would be the greatest nations if the border between two nations could have become like one which is between US and Canada. I agree with Sanjay, however Tamilselvan does have a point, hoping when India and Pakistan do come to their senses and leave all the hostilities behind, it will definitely help Pakistan in many folds which will even facilitate progress and people won’t be running off to India.